Compare prices from several car hire companies in Bilbao and find the best price for car rental. Our prices always include unlimited mileage and insurance. 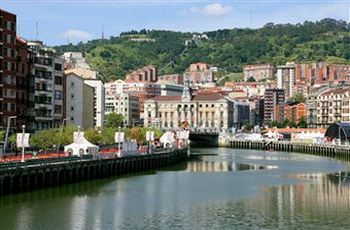 Bilbao is situated on the north coast of Spain and has an important port. The city is situated on the River Nervión about 12 km inland, and in 2008, the population of approx. 350 000. Bilbao dating back to around 1300 and the historic town with its winding streets and old buildings located on the west side of the Nervión. Here you can visit attractions such as Plaza Nueva from the 1800s and the beautiful opera house Teatro Arriaga. Bilbao is famous for its many museums, including an archaeological museum, a historical museum and the Museum Bilbao Fine Arts Museum. In 1997, opened the famous Guggenheim Museum. Bilbao Airport is a modern airport located about 12 km outside the city center. A new terminal opened in 2000.